Are there any windows more fabulous than bay windows? Bay window shutters maximise views and light, they enhance any room. Shutters are the perfect way to make any bay window even more beautiful. Beautiful privacy to get changed whilst still allowing light in. At night great light-blocking for a lovely night’s sleep. If you light it really dark then add blackout blinds for 98% light reduction. When fabrics and untreated woods can mildew, mould and warp in humid environments, bathroom shutters are the perfect choice. Wipe clean, durable and hard wearing, shutters are the bathroom window covering solution. Shaped shutters are the perfect solution for any shaped window whether angled or arched. No more strings and saggy blinds, just perfectly fitted shutters to allow the light to flow in! Our beautiful bespoke door shutters fit effortlessly on the inside of your doors! 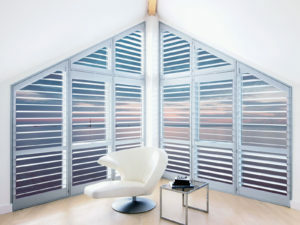 Add extra privacy, light control and peace of mind with our shutters. See some of our door shutter installations here. Shutters offer the perfect window covering solution for kitchen, being wipe clean and great even in humid environments, shutters look great and are exceptionally practical. See here for some kitchen shutters inspiration. Please browse our extensive shutter galleries. View installations we have completed and be inspired as to what we could achieve in your home. Just Shutters have successfully installed beautiful plantation shutters into the homes and businesses of over 8000 happy customers. We have installed shutters to every size and shape window, door, conservatory; Velux, roof, wardrobe, bar, room divide, space and area you can possibly imagine! And have achieved some very striking and unusual looks in our customers’ properties. You may want to view at our beautiful traditional look shutters. Alternatively browse the perfect bay window designs, or our colourful or unusually shaped installations. Whatever look you are after, we have a gallery of stunning plantation shutter images; showing you why Just Shutters are the experts! 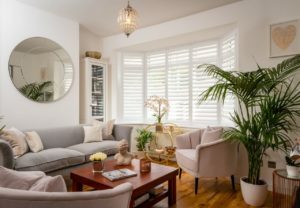 Interior window shutters can be used not only to achieve different looks and styles to fit any decor, but they are also the perfect window covering in each and every room, for a variety of reasons. From the aesthetics to their practicality. From their value to their ambience. As our window shutter images above will show you, they are perfect for the bedroom. Creating privacy, security and a peaceful ambience; also closing to 98% blackout (different options are available to achieve 100% blackout, just ask). Interior shutters are the window covering of choice when it comes to a humid environment; they do not damage, bend or warp. Furthermore, they do not mould or mildew; shutters are wipe clean and simply cannot be beaten as a choice in these steamy rooms. Conservatory shutters look beautiful! This is the reason why most people choose shutters for their conservatory. However, the fact that no other window covering can achieve the results in the spaces and challenging angles posed by conservatories; really does make shutters not only the designer choice, but the practical choice also. Shutters offer a hygienic, safe and furthermore, a practical solution in any business property. Browse our commercial shutter gallery to see why many businesses and organisations are opting for internal window and door shutters in their establishment. Of course shutters are ideal for any room within the home or business, and are simply perfect for bay windows. Please browse our shutter pictures above, request/download a free brochure, or book an appointment to see what Just Shutters can do for your home or place of work.